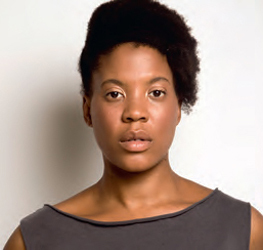 Xaviera Simmons produces installations, sculptures, photographic, video and performative works. She received a BFA from Bard College (2004) after spending 2 years of walking pilgrimage retracing the Trans Atlantic Slave Trade with Buddhist Monks. She completed the Whitney Museum’s ISP in Studio Art (2005) while simultaneously completing a two-year actor-training conservatory with The Maggie Flanigan Studio. Simmons has exhibited nationally and internationally where major exhibitions and performances include; The Museum of Modern, MoMA PS1, Nouveau Museum National de Monaco, The Studio Museum In Harlem, The Contemporary Arts Museum Houston, The Public Art Fund and The Sculpture Center. Simmons is a recipient of numerous awards including The David Driskell Prize, The Jerome Foundation Travel Fellowship, an Art Matters Fellowship and a SmARTPower Fellowship. Simmons was a 2012 AIR at The Studio Museum In Harlem. Selected projects and exhibitions scheduled for 2013 include “Artists Experiment” with The Museum Of Modern Art, “Radical Presence” at The Contemporary Arts Museum In Houston, “Rehearsals” at The Savannah College Of Art and Design, “Untitled” at The Aldrich Contemporary Art Museum and “Untitled” at The David Castillo Gallery among many others. Her works are in major museum and private collections including Deutsche Bank, UBS, The Guggenheim Museum, The Agnes Gund Art Collection, The Museum of Contemporary Art Chicago, and The Studio Museum in Harlem. In 2013 Simmons will be a visiting critic and lecturer in the Graduate Department of Sculpture at Yale University and an Artist In Residence at Anderson Ranch. Simmons is on the Board Of Directors of Spaceworks, a non profit real estate organization dedicated to expanding the supply of long term stable and affordable workspace for arts practitioners in New York City.